Office politics is a strategy of people to try and gain advantage, either for personal interest or a cause they support. The term often has a negative connotation, which is basically why people seek advantage of work matters at the expenses of others. 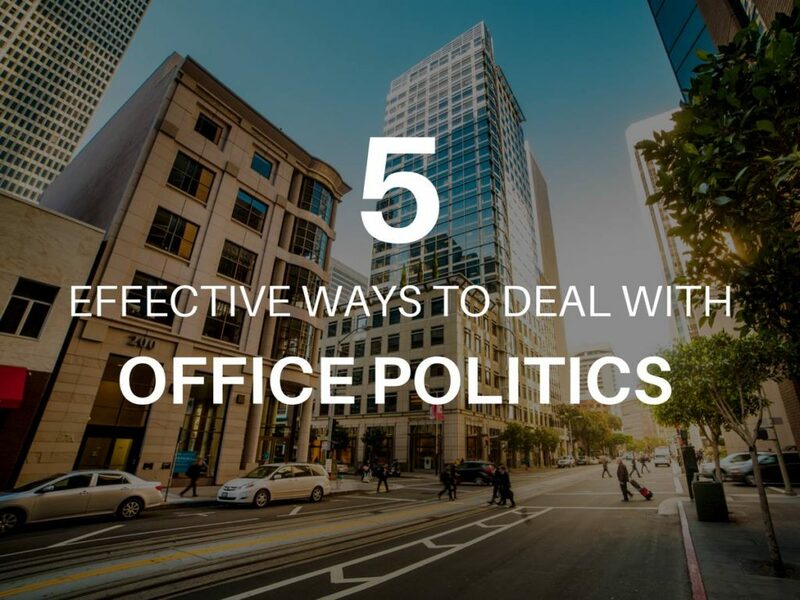 Here are five effective ways to deal with office politics. 1. CONCENTRATE ON YOUR WORK. BE PROFESSIONAL. Office politics is an issue of character. Until and unless your boss or colleagues in higher positions have decided to change how they lead their people, office politics and favoritism always be there. If you think it’s too unfair as you are more hardworking than your teammates, set emotions aside. But if this results to some serious personal offense like bullying, then that’s something you should act on already (this is another topic that I’ll be discussing in the next few weeks). If you let yourself get distracted with office politics, it will add stress and might negatively affect your performance. As you perform well, make sure others know about it. Sometimes silence at work is one reason why you aren’t getting the promotion or in this case, the favor of your boss. Because you’re too silent about what you do, for example, you often are timid when asked suggestions or opinions about a professional matter, your boss may be thinking that you aren’t cooperative. Your officemate gets more favor because he contributes something to the team. Make yourself better than yesterday. Strong skill set is a good insulation against office politics. Ask yourself, am I making greater work than what I’ve done yesterday? Sometimes there is a tendency to try and solve office politics. In wanting to become a hero and trying to fix it, you may unknowingly contribute to the problem by starting gossip within your team. Participating in mindless and senseless conversation isn’t the way to go. Live a career with integrity. Be very careful with every word you speak to your boss or to your officemate. Professionalism is the name of the game. Know when, where, and how to back off and move forward in every conversation you have with your boss. Even if it is a good idea, suggestion, or opinion that needs to be voiced out but will make your boss look bad, keep it to yourself or wait for your turn, either during a 1 on 1 discussion with your manager(s), performance review, feedback loop, and the like. Know your boundaries and what specific areas of work you’re only accountable to give feedback on. Learn when to back off or move forward. If you want to advance your career, there are battles you have to choose to win. Be aware of what’s going on in the office. There may already be serious offense on you that should be raised to the HR department or to upper management. Nonetheless avoid contributing to the problem. Use favoritism to your own advantage. For example, when asked during a 1 on 1 discussion how you can be helped with your work, you can say that you see that other team members are getting additional responsibilities. With that, you think you are also capable of working on those activities as well. This way, your boss can also see your eagerness to advance in your career and be a better contributor to your team – make those seemingly “unfair advantage” for others be a plus on your part.